As the holiday shopping season is now officially underway, police departments across the country are on high alert. That’s because, at this time of year, unfortunately, criminals are everywhere looking to take advantage of unassuming shoppers who are just trying to enjoy the season. The criminals go out to malls, downtown shopping areas and other retail hotspots just like the rest of us — but they, instead, are after the goods we’re buying, and the cash and cards that we’re carrying. It’s scary. And it’s sad. But it’s a reality of the world in which we live. With online shopping as prevalent as it is, and especially with peer-to-peer sites such as Craigslist so commonplace, we’re glad to see that local police departments are stepping in to help the honest shoppers as best they can. Recently, the Cherry Hill and Voorhees police departments announced a program available to the residents of its town. The department is providing two “safe zones” — one outside in the parking lot, and one inside the lobby — where people can conduct legal peer-to-peer transactions. Each location is equipped with security cameras that will record all activity in the zones, 24 hours a day, seven days a week. The Cherry Hill and Voorhees programs are timely, of course, with these types of transactions becoming more popular at this time of year. Neighboring Evesham Township released a similar program of its own in April. Police departments play a huge role in making people feel safe. Their job is not just to pull drivers over and arrest criminals. We couldn’t be happier about the “safe zones” program in Cherry Hill and Evesham, and we urge police departments in other towns to offer similar programs. 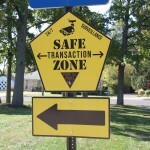 If other towns do offer the “safe zones” program, please remind your residents of it, and urge them to use it.